NASA's audacious plan to grab an asteroid and park it near the moon is short on candidate space rocks at the moment, one researcher says. It's possible that not a single known object meets the current criteria of NASA's asteroid redirect mission (ARM), astrodynamical consultant Dan Adamo said during a presentation with NASA's Future In-Space Operations working group on Wednesday (June 12). NASA unveiled the asteroid-retrieval mission in April. The current plan is to drag a roughly 500-ton, 23-foot-wide (7 meters) asteroid to a stable orbit near the moon using an unmanned probe. Astronauts would then visit the object using NASA's Orion capsule and Space Launch System rocket, which are slated to fly together for the first time in 2021. The ARM concept fits within President Barack Obama's vision for NASA's manned exploration program, which calls for the agency to send astronauts to a near-Earth asteroid (NEA) by 2025, then on to the vicinity of Mars by the mid-2030s. ARM is similar to an idea proposed last year by scientists based at Caltech's Keck Institute for Space Studies in Pasadena, Calif. The Keck study estimated that a robotic spacecraft could drag a 23-foot NEA into a high lunar orbit for $2.6 billion. Such a mission would help develop asteroid-mining technology and advance scientists' understanding of the early solar system, advocates say. Capturing an asteroid could also have big returns in the manned exploration arena. Scientists think at least 1 million asteroids zip through Earth's neighborhood, but only 10,000 or so of these close-flying space rocks have been identified and catalogued to date. Adamo scrutinized the known objects, looking for potential ARM targets. He first zeroed in on bodies with "sufficiently Earthlike" orbits — nearly circular paths in much the same plane as Earth, with an average separation from the sun within 20 percent of the Earth-sun distance (which is about 93 million miles, or 150 million kilometers, and is known as an astronomical unit, or AU). Adamo then excluded any asteroids in this group that would zoom past Earth at too great a speed — more than 4,475 mph (7,200 km/h) relative to Earth — and came up with a list of 18 "highly accessible" space rocks. But some of these 18 are definitely too big for ARM as it's currently envisioned, and many others may not fit the size criterion (estimates of the space rocks' diameters are generally imprecise). In short, the cupboard is looking pretty bare at the moment, with no slam-dunk asteroid targets just begging to be captured. Two strategies could help give ARM the best chance to succeed in the near future, Adamo said. The first is to find more potential targets, by launching an asteroid-hunting space telescope as soon as possible. 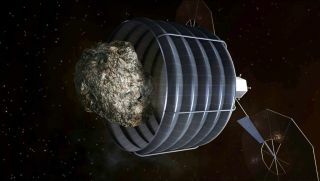 The second idea involves modifying ARM to retrieve a chunk of a big asteroid — a 100-ton piece of a 330-foot (100 m) object, perhaps — rather than an intact small space rock. There are several advantages to targeting larger near-Earth objects (NEOs), Adamo said. They're easier to find and track, for example, and are more likely to exhibit stable and slow rotation. "Larger NEOs are just going to be easier to approach and get close to," Adamo said. Bigger asteroids are also more likely to be compositionally diverse, offering a probe several different sampling targets, he added. "You're like a kid in a candy store instead of just out there with one object, as the current concept would advocate," Adamo said. However NASA decides to proceed with ARM, the agency will need to work quickly if it hopes to execute the bold mission in the next decade or so, Adamo said. That's especially true if NASA aims to launch a precursor mission to verify the suitability of an intended target. "This is a compressed schedule any way you slice it, particularly if you want some kind of mission assurance," Adamo said.